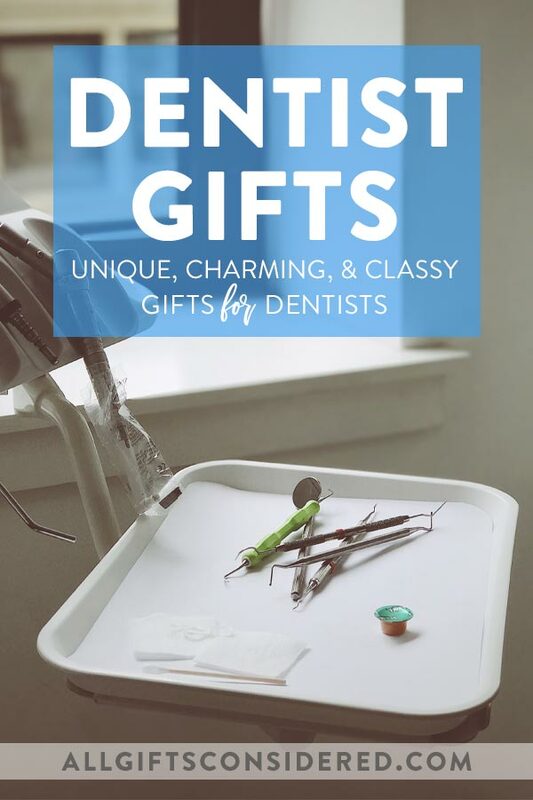 Let’s take a look at 14 of the best gifts for dentists we’ve found from around the web. 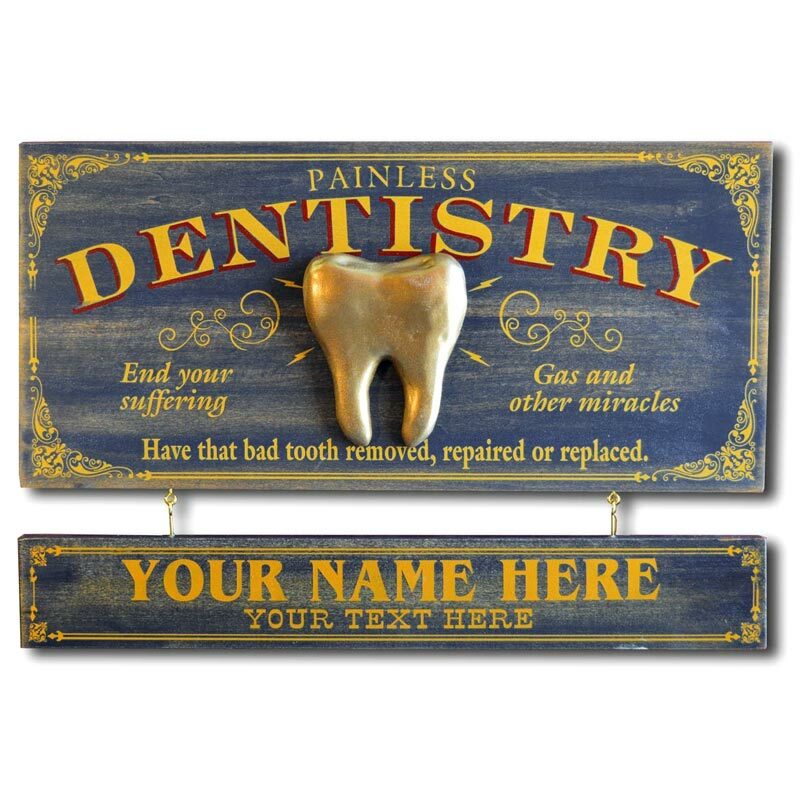 Genuine wood dentistry sign, crafted in the USA. Gorgeous old-fashioned printing and distressed by hand, includes a 3-dimensional relief of a tooth which is also handcrafted. The optional hanging nameboard can include up to two lines of text, and you can actually get additional nameboards for each person in the office. Just hang them one after the other below the dental plaque. P.S. It’s kinda funny to get a dentist a plaque, amirite? Another fun gift with a tongue-in-cheek jab at dentist tropes… Sugar is bad for your teeth, eh? How about an entire box of sugar cookies, personalized with your name or office name in bright and cheery frosting? 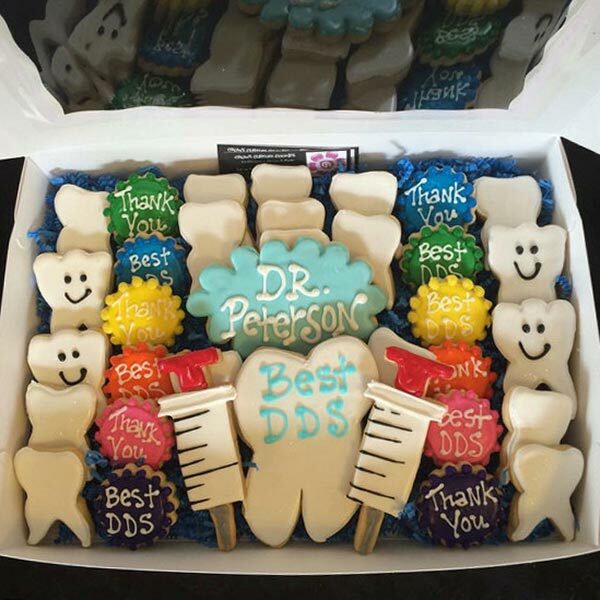 Baked to order in a small California sweetshop and delivered to your dentist’s door, this dentist cookie gift box is a beautiful (and tasty!) way to say thank-you. Get your cookie box here. 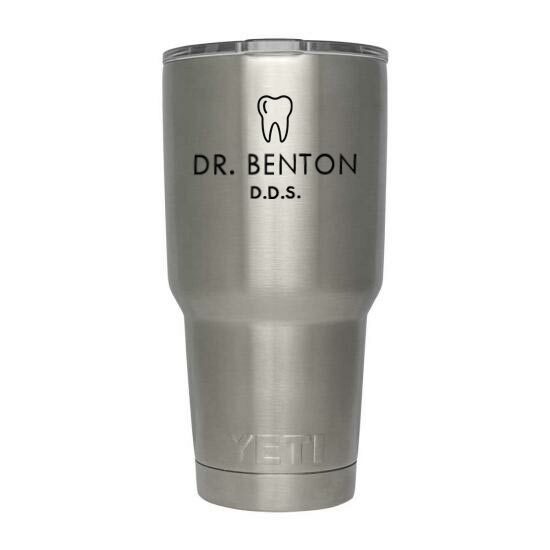 Your dentist will not fail to appreciate this fact (or rumor, according to some) when you present this personalized YETI tumbler. You can always toss in a reusable straw just in case. YETI tumblers are famous for the double-walled, vacuum-sealed temperature control, so the coffee will stay steaming hot or ice cold all day long, or can be used for water to keep hydrated throughout the day. Plus, it includes custom laser etching of the good doctor’s name, dental practice logo, or a fun quote. The ultimate dentist gift. Check out all the sizes here. For a more affordable alternative to the YETI brand mugs, try these Polar Camel tumblers. They test the same as YETI, just without the logo and high price tag. 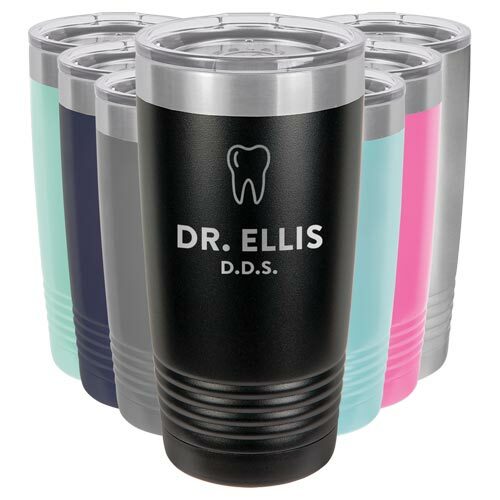 This is our personalized dentist tumbler, which is set to include the tooth image plus your dentist’s name and more. Choose from seven different colors, with awesome bulk discount rates so you can get one for each team member. 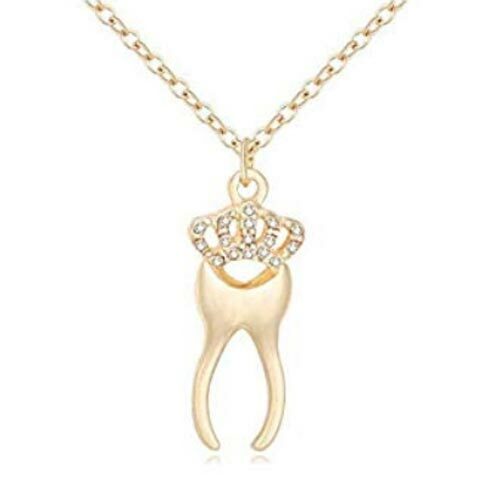 Dentist jewelry with style and just a bit of flair… How about a crowned tooth necklace? Available in gold, silver, or rose gold, this necklace is the perfect gift for a dentist, dental assistant, or secretary. Celebrate a true professional! 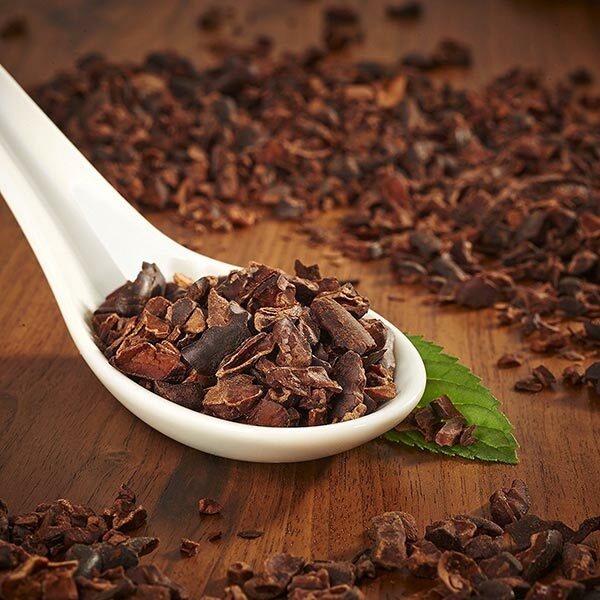 Did you know that dark chocolate is not only becoming renowned as an antioxidant-rich superfood, it also has many benefits for your teeth? Your dentist probably knows this. According to some studies, the compounds in chocolate may even be more effective at fighting tooth decay than fluoride. So if you’re looking for high-quality niche gifts for dentists, try a bag of Organic Cacao Nibs. These are about as close as you can get to the original cocoa bean, giving you the maximum benefits chocolate has to offer. You can also go with some good quality 70% or higher dark chocolate. This isn’t quite as “pure” as the cacao nibs because of the little bit of sugar, but it’s still pretty healthy and quite the tasty treat for a dentist. A new take on the iconic athletic swoosh. 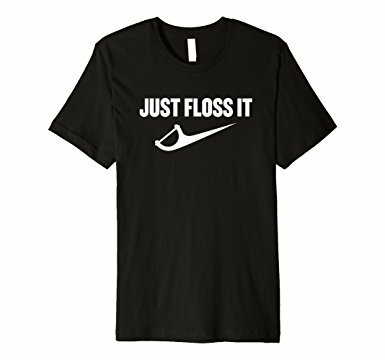 This is a premium-fit dentist humor t-shirt that comes in several colors, perfect for the active and fit dental professional. 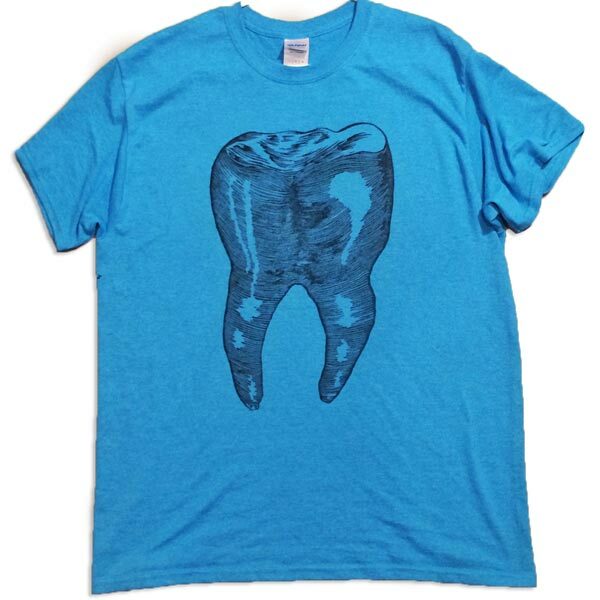 Get this dentist t-shirt here. 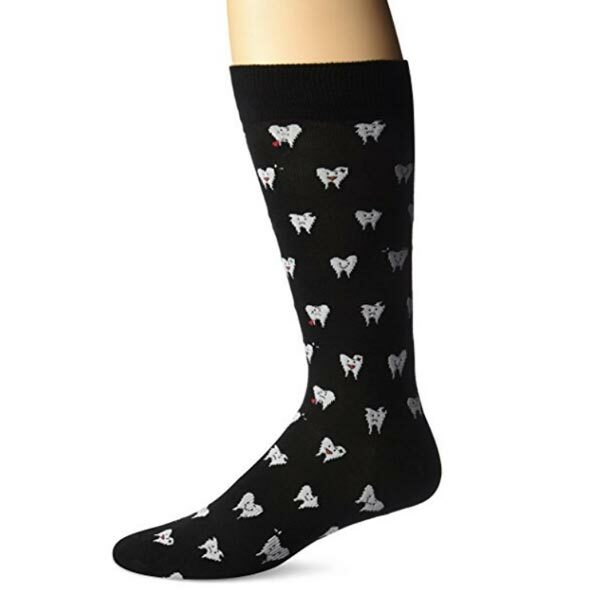 Anyone with a quirky sense of humor and fashion sense will love these novelty dentist socks. Patients with a keen eye will get a chuckle out of these, and they’re comfy to boot. Get your dentist gift socks here. Three award-winning Eastpoint Cellars wines include cabernet, chardonnay and merlot, a reusable keepsake wine stopper, plus complementary treats such as premium chocolates, cheeses, crackers, olives, and cookies. All in an attractive presentation, delivered to you door or the door of a dentist who loves wine. If you like the wine theme but want to go with something a little less traditional – or something that lasts a little longer! – check out our collection of gorgeous wine decor, most of which includes personalization. For a longer-lasting wine gift, try a curated wine subscription from Winc tailored to the recipient’s tastes. Here’s one thing we know about dentists: They need to eat, just like everybody else. True story. 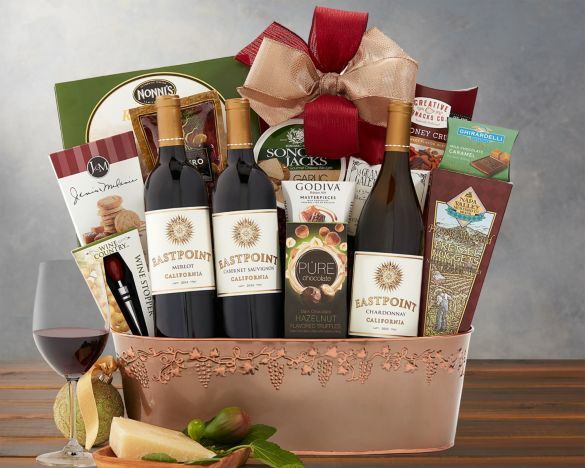 Just like you, they would love to receive a stunning gift basket filled with a variety of dried fruits. Exotic mango slices, Mediterranean apricots, luscious California yellow and white peaches, mouth-watering pears, Washington apple wedges, and delicious California dates, plums and prunes. Yum. 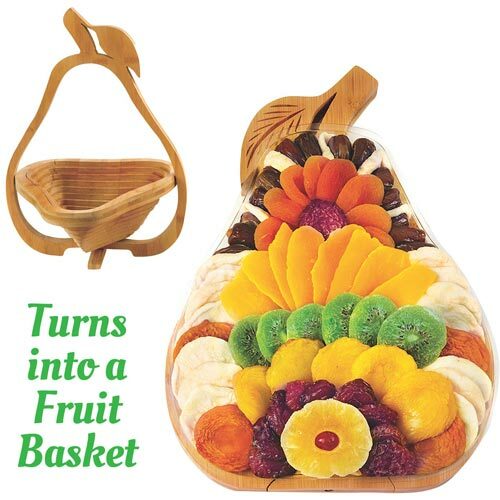 Oh, and the gift basket TURNS INTO A LITERAL FRUIT BASKET! Yep, this is the gift that just keeps on giving. Get yours here. 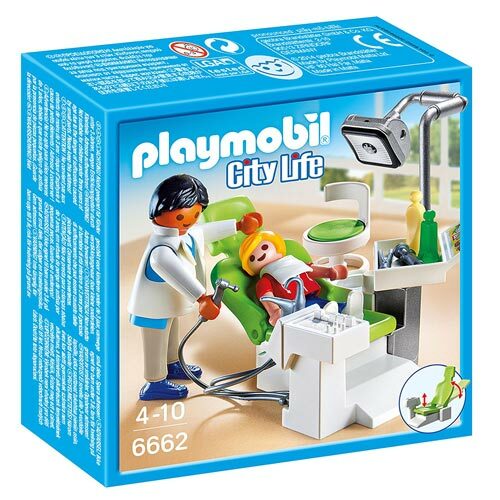 The classic Playmobil toys in a loveable dentist and patient set. Put it in the waiting room or on the desk for the kid-at-heart dentist. 11. Coffee Mug for the Best. Dentist. Ever. Sometimes a simple gift makes a big statement. 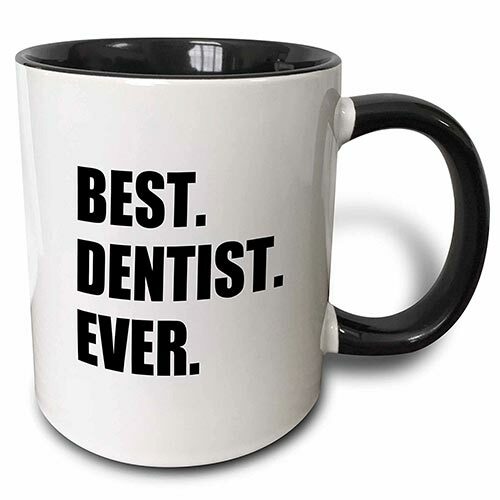 A dentist can never have too many coffee mugs, especially ones that boldly proclaim the truth. Hand printed on a homemade press, this artisinal dentist shirt is printed on Gilden 100% cotton t-shirt, each shirt is created individually using a hand-cut relief woodblock. Inked, pressed, and printed directly, fresh for you to wear or give in a variety of colors. This niche dentist t-shirt can be ordered here when available – apparently they sell out all the time! 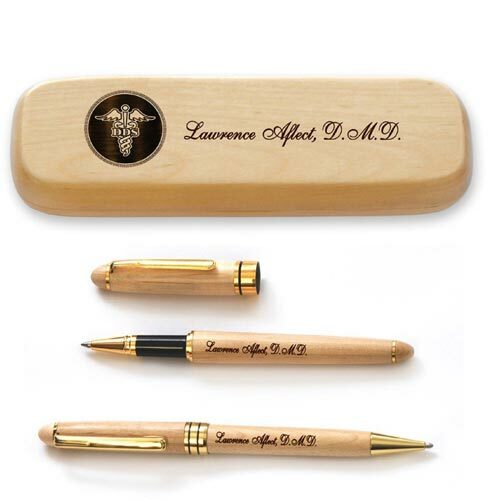 A classy maple wood box and pen set, engraved with the DMD’s name and qualifications. Includes the DDS logo, if you would like something a little more customizable check out the pen box here and the maple pen here, either of which can be custom engraved with any text, logo, and font. 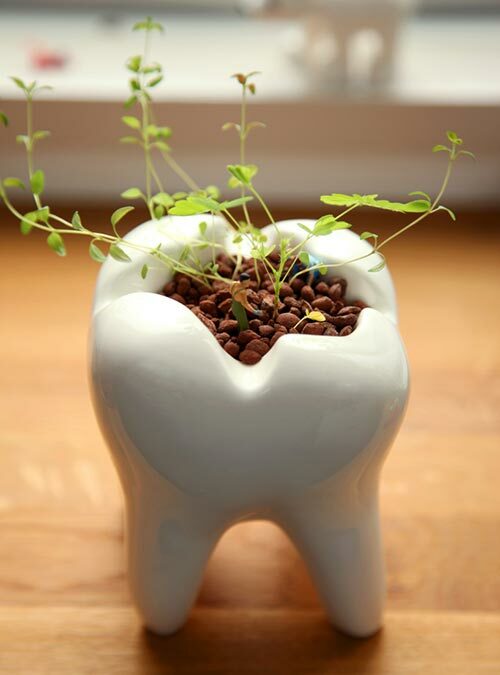 This molar vase will be a winner with any dentist who has a bit of a green thumb. Ideal for small plants like succulents, this little guy will look great at home or at the office. Get your very own tooth-shaped planter here. 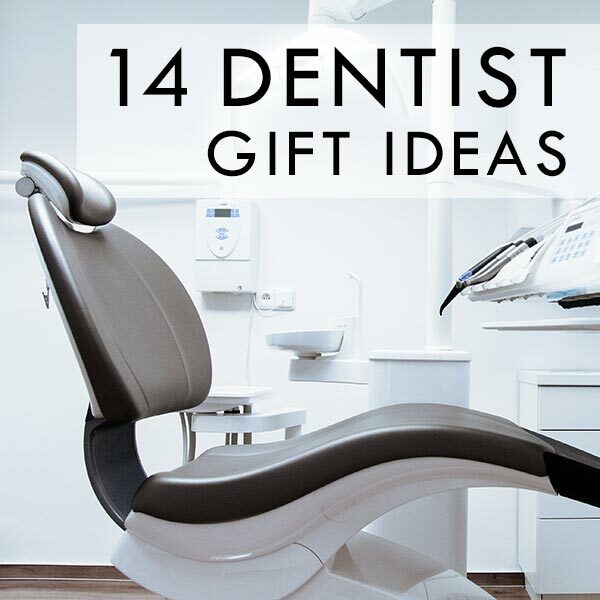 So that’s it, our 14 best dentist gift ideas! Please pin this to your Pinterest boards using the image below (or pin your favorite ideas above), and let us know in the comments if there is anything else spectacular that we should add.